paleo and whoel30 approved fish tacos that you bake in the oven. simple dinner recipe. Takes thirty minutes to cook. I am not going to lie to you... I don't really like fish. There are a few reasons, but mostly I am just not crazy about the taste. However, as I am constantly saying, we need to be eating it at least weekly. Annoying... haha! Little ones' brains are developing on hyperdrive the first seven years of life. Fat is what fuels this, more specifically the fat from fish. Want more information on what to feed your babes? Read more here. If you can't get your children to eat fish no matter how hard your try you might want to supplement with fish oil, my favorite is here. Basically, I decided to figure out a few ways that I enjoyed eating it and cooking it. This sheet pan way of making crispy fish tacos is so simple it is just stupid. This leaves me no excuse not to eat fish. Even though this recipe bakes in the oven it does create a crispy "breading" coating for the fish that tastes like they were fried. I have only ever made this dish with the fish Mahi, Mahi. It is by far our favorite. However, I am sure that most any white fish would work. If you use a fish like Cod be aware that the baking time might change slightly. Combine the chili, garlic, and almond flour. Lay the fish out on the pan. Pour the dried mixture on top, spread out and then pat down. While cooking make a coleslaw if you would like and warm up your tortillas. When the fish is done cut into strips and plate. Note: If the fish has skin on it don't freak out. Don't try to get it off before you cook it, trust me. Put the skin down on the pan. Once it has cooked it is pretty easy to just use a fork to separate it. Then you can cut it into strips. Additional Note: The tacos in the photograph are grain free, Siete Tortillas. My kids love tacos so I don't have to work hard to get them to eat this. I have also served this as fish sticks which was a hit as well. Want to make this even more fun?? 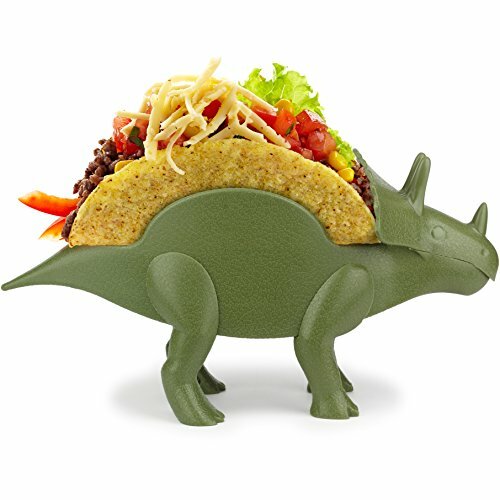 Try this taco holder out.